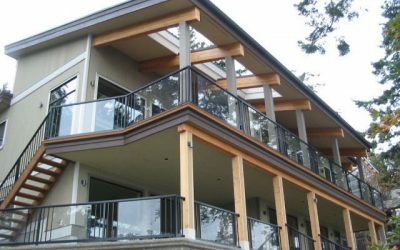 Get the deck you’ve always wanted, professionally installed by the most seasoned and experienced installers in Nanaimo! Choose Duradek™ sheet vinyl membranes, and never sand or stain again. Durable, attractive and maintenance-free, step onto a Duradek™ and step into a lifestyle. Duradek™ never rots, and is proven tough. All areas that need a skid resistant, waterproof surface come to life with Duradek™. Over 125,000,000 square feet of this great product have been installed across North America! 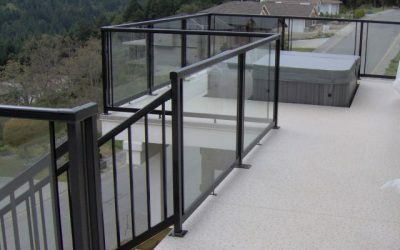 All across Nanaimo, many homeowners are living it up on a Duradek™ vinyl surface. For more information go to Duradek.com! Visit our Cleaning page for useful information on caring for your Duradek™ product. All products designed for exterior use will eventually be affected by Mother Nature. PVC, man’s best attempt at prolonging the life cycle of various building products, performs an admirable job in delaying the inevitable, but it will show some signs of degradation. Rays on the skin are common. After a period of years these same rays may affect outdoor products and therefore manufacturers add UV screen and stabilizers to prolong the life of PVC (vinyl) materials. These screens are designed to resist the cracking, embrittlement and discoloration of the vinyl. The thicker the vinyl, the greater the resistance to degradation will be. The prime function of the sheet vinyl product you’ve purchased is to waterproof the space beneath, to protect the structure from rot, eliminate maintenance and to provide a durable long lasting, skid-resistant surface. Its initial appearance will eventually deteriorate, but this does not affect its ability to provide waterproofing. The strength of our system is in the method we use to weld the vinyl sheets together. The surface vinyls are overlapped and heat fused. The seam is visible. Other systems that use invisible seams that were butted together sometimes experienced waterproofing failures. Like any other floor surface, vinyl may scuff if abused. Try to avoid dragging heavy objects over unprotected PVC. Skidding a bicycle tire, a roller blade or the edge of a running shoe across the vinyl creates friction, and the extreme heat and abrasion may possibly remove the print. Normal traffic will not damage the vinyl at all. 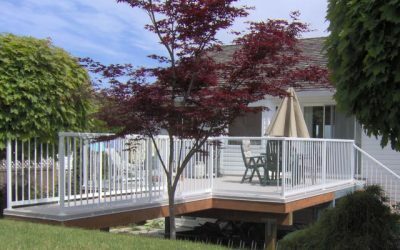 Enjoy your deck for many years to come with these simple maintenance recommendations.